Nelson Juarez, OD, not only practices family eye care in Texas City, but also makes his home in the community. A native of Galveston, Dr. Juarez graduated from Galveston Ball High School. 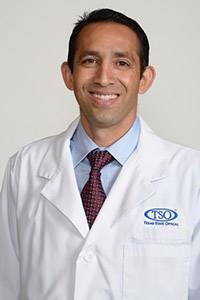 He studied at the University of Houston where he earned a degree in biology in 1999 and went on to graduate from the University of Houston College of Optometry with a Doctor of Optometry degree in 2003. Dr. Juarez is a therapeutic optometrist who can diagnose and treat many medical eye care conditions. He stresses the importance of an annual eye exam because many eye diseases are not detectable without a dilated eye exam. Active in the community, Dr Juarez is a member of Rotary Club in Texas City. With a strong commitment to “Service Above Self” rotary members volunteer in communities at home and abroad to support education and job training, provide clean water, combat hunger, improve health and sanitation, and eradicate polio.